Military Family Month was established in 1996 by the Armed Services YMCA, with the U.S. Government recognizing the occasion every year since. Each November, The Armed Services YMCA celebrates Military Family Month to demonstrate the nation’s support and commitment the families of military personnel. With hundreds of thousands of service members deployed overseas, recognizing the daily sacrifices made by military families has never been more important. Click here to see the 2016 Presidential Proclamation. 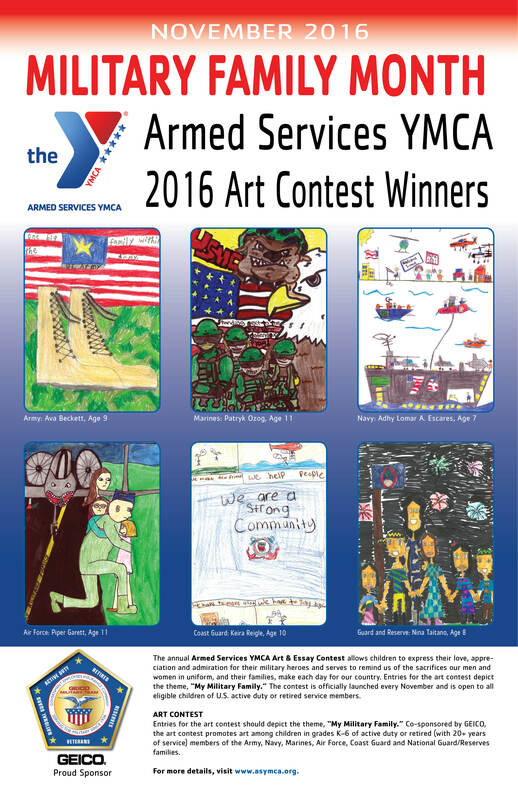 Looking for the Annual ASYMCA Art & Essay Contest information? Please visit the Art & Essay Contest page. The Armed Services YMCA provides free or low-cost youth development, healthy living, and social responsibility programs for junior enlisted military & their families.